Following a particularly successful year, Meercat Boats has further strengthened its management team. John Buck has been appointed Meercat Boats’ Business Manager. Coming from a strong production engineering and manufacturing management background, John’s work over the past three years has included the build and sale of new commercial vessels. Glenn Springett, Meercat Boats’ Shareholder Director, comments, “We are thrilled to have John on board. 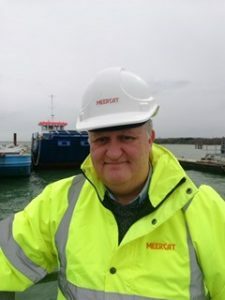 He brings a wealth of experience spanning business development, fabrication and production management, therefore is ideally suited to his new role at Meercat Boats”. George Davy, who has been a Project Engineer at Meercat since 2017 when he joined in a junior role has been nominated for the prestigious European Commercial Marine Young Person’s Development Award. Several longstanding members of the Meercat team have recently celebrated their work anniversaries including; Lead Hand, Czes Ostrovski (12 years), Fabricator, Lukaz Malek (11 years), Production Foreman, Slawomir Guzynski (10 years), and Office Manager, Carolyn Gamblin (7 years). Meercat won a successful tender bid in February 2019 valued in the region of £1million, for a 15metre multirole workboat destined for harbour support duties for Guernsey Harbours. December 2018 saw a 15metre multirole vessel delivered to the Scottish Salmon Company, where it immediately commenced operations in aquaculture support. In addition, the specialist workboat builder has just launched its largest Meercat built to date, the MRV22, being a 22metre multirole vessel. This craft has landing craft capabilities, thanks to its bow door configuration and will be officially handed over to its new owners at Europe’s largest commercial marine exhibition, Seawork, in June. Since its inception in 2007, Meercat Boats has delivered multirole steel workboats to European port harbour servicing, Scottish fish farms, as well as UK wind farms. In Spring 2018, the leading civil engineering specialist, Topbond plc, which had already purchased a Meercat in 2016, purchased the company, ensuring financial stability for the workboat builder. Meercat has vessels undertaking port and harbour servicing, civil engineering, aquaculture support, rescue and the renewables; operating in the UK, Middle East, Europe, Africa, Saudi Arabia and Australia, in addition to other locations. Clients include; BAE Systems, Williams Shipping, Associated British Ports, The Scottish Salmon Company, Dawnfresh, Zamil Offshore and Port of Plymouth. Visit www.meercatboats.com for further information or meet the Meercat team in June on stand PY40 at Seawork International. Meercat Boats are located in Hythe near Southampton in Hampshire, UK. The company employs 14 staff. Meercat Boats multirole vessels (MRV) range from 14-24 metres and are built in twin, triple or single hull variants, plus, uniquely also have road-transportable options. Meercat Boats are in operation in the UK, Middle East, Europe, Africa through to Tanzania and Australia. Clients include; BAE Systems, Williams Shipping, Associated British Ports, The Scottish Salmon Company, Dawnfresh, Zamil Offshore and Port of Plymouth. Hi-resolution images are available upon request. Unless specifically stated, please credit images to Meercat Boats.